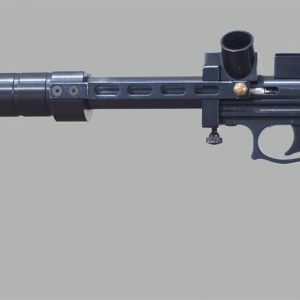 The Sweeney gun is a special effects capsule launcher that was designed in 1984 by Matt Sweeney and Lucinda Strub out of North Hollywood, California. 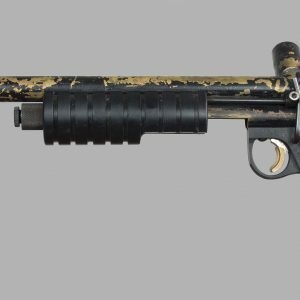 This capsule launcher never played a roll in paintball, but does shoot .68 caliber paint, lead, explosive, glass, and powder balls. 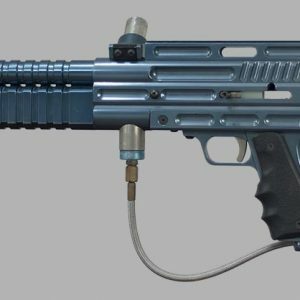 With the introduction of semi automatic paintball markers in the early 1990s (and the Tippmann SMG 68 in 1989), special effects technicians were able to find launchers that performed close to the same task for a much lower price. The Sweeney Select Fire Capsule Launcher received an Academy Technical Achievement Award in 1987 (an Oscar), and is still available new for $3,450 from Matt Sweeney. Find more details on another Sweeney gun here. Prints of this Sweeney Gun Capsule Launcher are available in the following dimensions on Epson Premium Luster Paper. 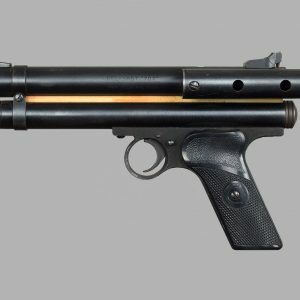 PLEASE NOTE – THIS ITEM IS FOR THE PRINT ONLY – THE SWEENEY GUN CAPSULE LAUNCHER IS NOT FOR SALE.